Let me be clear. I’ve never worn blackface and can’t for the life of me understand why someone would think it is okay. But, I’ve been guilty (when much younger), of making the insensitive and derogatory comment that, “those who can, do, and those who can’t, teach.” I was referring to military trainers, not K–12 teachers, but I am still mortified and profusely sorry for ever thinking, let alone saying that, about any educator. I was ignorant and didn’t know what I didn’t know. I now know that good teachers are highly skilled professionals who have honed their art. I know that the overwhelming majority of K–12 teachers have chosen their profession because they have a passion for helping children grow and thrive. I also know that teachers are the number one in-school factor to student success. I fervently believe, that if we are to truly unleash our students’ and our state’s potential, we must focus on preparing, hiring, supporting, and trusting, high-quality, professional educators. I was surrounded by several hundred such professionals at this year’s Arizona K12 Center’s 10th Celebration of Accomplished Teaching. 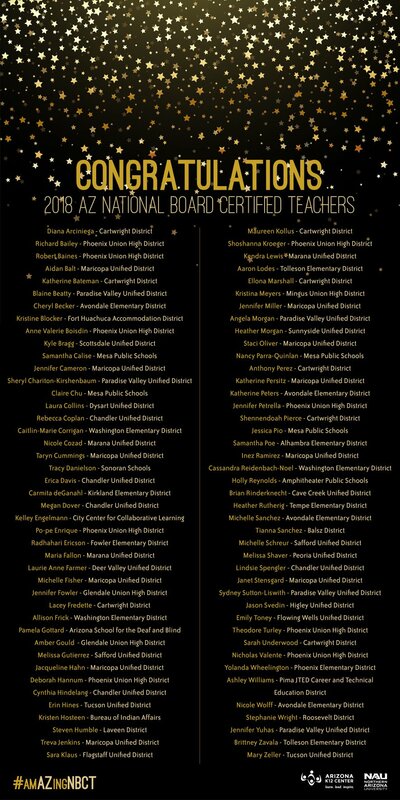 It was a wonderful gala to celebrate the 136 Arizona teachers who achieved or renewed National Board Certification (NBC) in 2018. As a professional educator (what a breath of fresh air that is), Arizona’s Superintendent of Public Instruction, Kathy Hoffman, understands how important professional development is for educators and the students they teach. Speaking at the Celebration event, she lauded the 86 new and 50 renewed NBCTs for 2018. She also told the audience she is absolutely committed to maintaining her unbridled optimism in support of Arizona’s educators. The future of our state she said, will be determined by the future of our students, and they must have professional educators to prepare them. 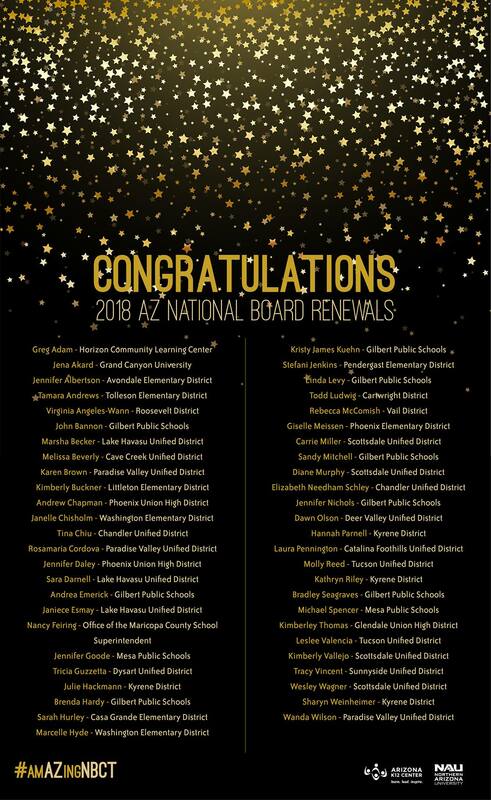 At a time when challenges abound for public education in Arizona, she proudly highlighted the fact that our state is 18th in the nation for the total number of NBCTs and 14th in the nation for the number of new NBCTs. We’ve already seen how lowering job requirements for teachers hasn’t helped improve retention, with only one-third of the way into the 2018–19 school year, almost half as many certificates being issued to untrained teachers as the entire previous year. How’s about we try something else? I don’t know…maybe like treat our teachers as the professionals they are and encourage and support their efforts to continue to develop their craft? The solution to our teacher retention problem is staring us in the face and is the same solution that will drive more student success. That’s because teacher working conditions are student learning conditions. Only when we truly embrace this concept will we begin to make sustained, statewide progress we can all be proud of.